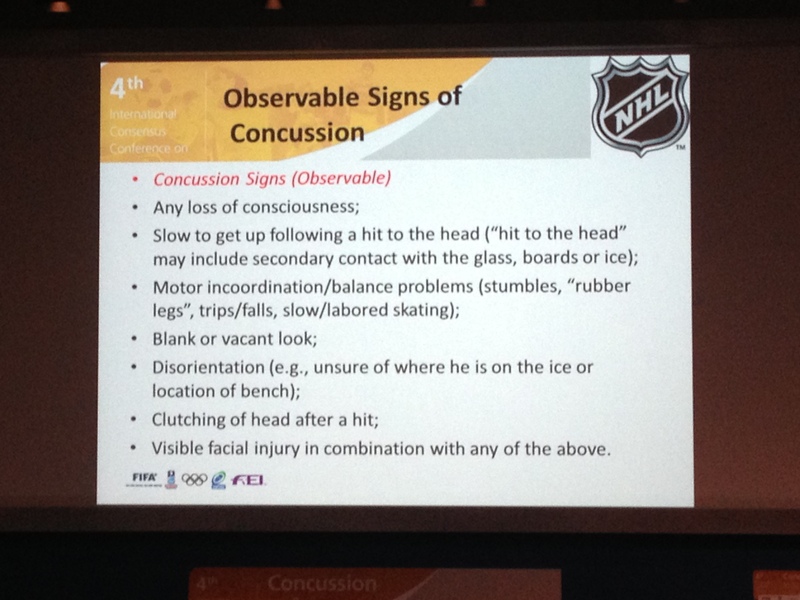 Observer (athletic trainer eye in the sky) – side note on this: all presenters today acknowledged that observers at games, be it in NFL or Aussie Rules or Hockey or Soccer all had good reliability with identifying possible injuries – kind of like what I do when watching other games. Side note on AFL: they produce a PUBLIC injury database on injuries after the season is complete. Also in a side conversation with Dr. McCrory the league medical office reviews all incidences and those found by observers and questions the medical officers of the team. If there was some inappropriate behavior then they must “explain themselves” to the league and if they erred then the team is punished. Next topic was with media and legislation, presented by Dr. Stan Herring, and he was very good. He began the presentation with a “personal” touch as he showed us the Zackery Lystedt injury and interviews. It got our attention for sure. He went on to discuss the good work by the CDC, I concur. As for legislation it is catching on and is a good start, and the design is for each piece to be living and have the ability to change as warranted. Before Zack Lystedt there were 7 laws, currently there are 40. He discussed legislation versus education and noted there has to be both in order for no one to ignore this issue. Education must be consistent, but is creates rules that are different, here is the need for legislation to attempt to get everyone on the same page. The education and legislation after the Lystedt laws have affected change in the NFL, ACSM and nationally. Dr. Bob Cantu was next about the implementation of said consensus statements, legislation and education. He pointed to the fact that the NFL and NCAA changed the thought on RTP same day after Zurich 2008, so it has some effect. He feels that what is working in the United States in the education from places like the CDC, because of its access (free) and co-branding from other entities. He also discussed how the media has played a role in the implementation of the consensus statement and educations, citing Teddy Johnson from the New England Patriots. During a quick Q&A session Dr. Prestorious (sp) from South Africa made a good point about education of colleagues (other doctors) about concussions and management of concussions – AWESOME POINT! Dr. Cantu underscored the need for independent observers where applicable. A comment from the gallery basically noted that not all doctors are trained or have experience with concussions and this is a problem. Another comment was about unattended consequences since Zurich 2008; more frivilous injuries or longer out periods without true knowledge of the injury put in place by doctors. LUNCH – it was very good in case you were wondering, Dr. Tad Seifert, Dr. Simon Kemp stopped me to say hi! Also side note Dr. Broglio is highly cited in all the work so far and going forward. That dude does good work! Truly lucky to be here!!! i just found the concussion in sport site: http://concussion-in-sport.com/2012/ today. have you been aware of the above site for a while, or was i just locked in my own google tunnel of search that drifted me away from finding it earlier??? will be looking for your own take on the meeting as it continues and comes to a close..
Keep up the good work Dustin!! Thanks for sharing Dustin. Encouraged to see return to learn/return to school being addressed.